Turbo Collectors being installed at the College of Muscogee (Creek) Nation. A crew of drillers working to install our patented Turbo Collectors at the College of Muscogee (Creek) Nation in Okmulgee, OK. 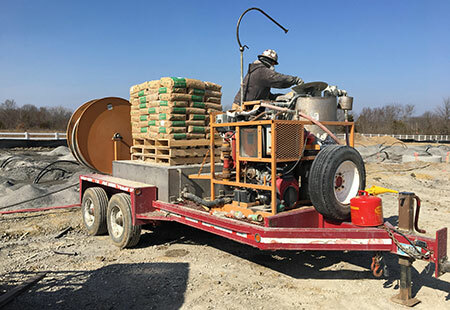 Thanks to the recommendation of our customer, Geo-Enterprises, the Creek Nation will be soon be enjoying additional savings to the already efficient geothermal installation. The Creek Nation are proponents of geothermal HVAC systems and have installed many of their newer buildings with the technology, including the main building currently on the campus as well as student housing on campus.